Currently, the primary microbiological test that I use for testing fuels, fuel-associated water and fuel system components is ASTM D7687 Test Method for Measurement of Cellular Adenosine Triphosphate in Fuel and Fuel-associated Water With Sample Concentration by Filtration. The ASTM method is based on a test kit manufactured by LuminUltra Technologies, Ltd.; with whom I collaborated to develop and validate the method. Fig 1. 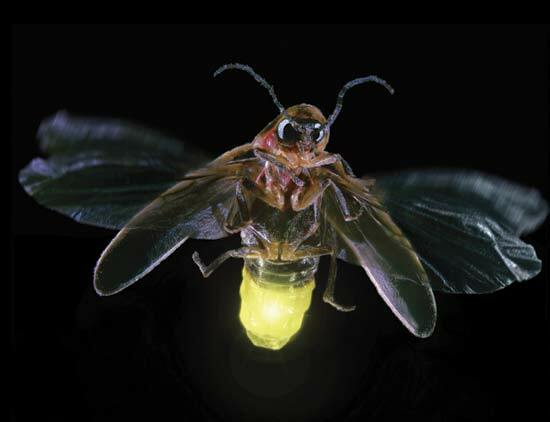 Firefly with its tail aglow. In 1954, microbiologists first reported a method for using firefly tail extract to measure microbial population densities in water samples. By the late 1960’s it was known that bacteria had – on average – 1 x 10-15 grams (1 femtogram; 1 fg) of ATP per cell. Even though the actual amount of ATP per cell was quite variable, the 1fg/cell ratio soon proved to be quite reliable. In the mid-1970’s I ran thousands of ATP tests on ocean water samples. However, when I attempted to use ATP to test oilfield produced water samples, I learned about interferences cause by salts and organic chemicals. High salt concentrations (brines) and some organic chemicals depressed test results – indicate that the ATP-biomass was less than it actually was. Other organic molecules emitted light (i.e. were chemiluminescent) that gave false positive test results in samples that had few metabolically active microbes. The bottom-line was that I could not use ATP for testing microbial contamination in complex organic fluids such as fuels, lubricants, or metalworking fluids. Between 1980 and 2008, a number of ATP test kit manufacturers made claims about the stability of their kits for testing fuels, but the QGO-M method – developed between 2008 and 2009 – remains the only one that is not affected by either the salts or organic chemicals that make other ATP tests unusable for fuel or fuel-associated water testing. Where [tATP], [cATP], and [dATP] are the concentrations of total, cellular, and dissolved ATP, respectively. Fig 2. 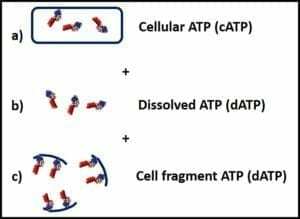 ATP in fuel and fuel-associated water samples: a) cellular ATP – ATP within whole (intact) cells; b) dissolved ATP – individual ATP molecules in solution; c) cell fragment ATP – ATP that is bound to pieces of cell wall from cells that have broken apart. Because there is no easy way to differentiate between (b) and (c), the term dissolve ATP generally refers to the sum of (b) and (c). The QGO-M method washes away dATP before breaking open cells to release ATP for detection. This means that it measures what’s important: the [cATP] in whole cells. In contrast, test methods that give only [tATP] results cannot determine whether the detected ATP came from whole cells, cell fragments, dissolved ATP or some combination of the three. The QGO-M method doesn’t provide all the answers about fuel and fuel system microbial contamination, but it’s my go to, first test. First, I can run the test out of the back of my car. Second, I can complete a test in less than five minutes. Third, I get results as actual ATP concentrations ([ATP]). The other commercially available test kits give results in instrument specific relative light units (RLU; more on this in a bit). Fourth, as explained above, the QGO-M method detects [cATP]. The other test [tATP]. Consequently, ASTM D7687 is the only ATP test method that provides reliable test results for fuel and fuel-associated water samples. Coming back to RLU: as I mentioned above, the ATP test measures the intensity of light produced by a biochemical reaction. The device used to measure the light intensity is called a luminometer. Basically, it counts the number of photons (light emissions). The unit of measurement is RLU. The RLU is different for every luminometer. Unless RLU are converted to [ATP] data from different luminometers cannot be compared. The QGO-M method includes determination of the RLU produced by an [ATP] = 1 x 10-9 pg mL-1. It also provides an equation for converting test sample RLU to pg mL-1. Thus, numerous technicians each collecting data using their own luminometer can share data. Moreover, the ATP data can be pooled into large databases so that the relationships between [ATP] and biodeterioration can be better understood. I consider this to be a major advantage over other ATP tests. As a first-tier test to tell me whether I should run additional microbiology tests (see Part 8). Table 1 shows the criteria I use for screening fuel and fuel associated water samples. For routine condition monitoring and predictive maintenance (PdM), [cATP] data alone are sufficient to guide PdM actions. When results are in the negligible zone no additional PdM is needed. When they are in the moderate zone, it is time for preventive action, and when they are in the heavy zone, only corrective action will suffice (I’ll discuss preventive and corrective actions in a future blog post). Table 1. QGO-M test method PdM criteria. Part 15, I’ll discuss how to use ATP to detect and quantify biofilms (microbiological growth on surfaces). In Part 16, I’ll discuss using these data to determine what additional microbiological tests are needed. In the meantime, if you’d like to learn more about fuel and fuel system microbiology testing, please contact me at fredp@biodeterioration-control.com.